It has, to my surprise, been ten years since we last went south-west. It was high time we went again. So we did, taking advantage of a card that had been in the metaphorical back pocket for some time, namely the opportunity to stay in a railway carriage. Regular readers will recall we stayed a night at the Sleeperzzz hostel at Rogart in 2011, but this time we wanted more. After a lot of searching and bargaining we obtained bookings for three nights at the Railholidays camping coach next to the station at Hayle, two stops short of Penzance, in early June. This meant a variation from our usual departure date at or around the summer solstice, but flexibility is our middle name (one of many, to be truthful) so the deal was done. Another variation, in fact a world first for a sleeper trip, was the chance to visit a garden railway. 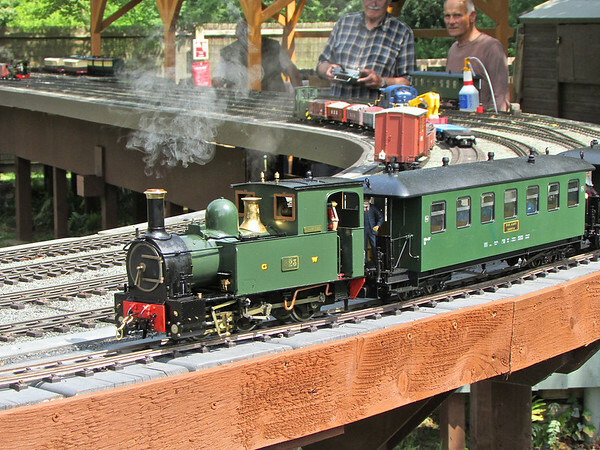 Nick Wood, a founder member of Southport Model Railway Society, lived in Wadebridge, had a 45mm gauge railway in his garden, and was willing to entertain us for an afternoon. An offer not to be missed, so the itinerary was carefully massaged to fit in with his availability. As it happened, it was one of two 16mm lines we visited on this trip, as will become clear. It is becoming increasingly common on these trips to start off numerically incomplete, picking up other members on the way. This time four of us assembled in the Virgin First Class Lounge at Liverpool Lime St to await the train to London and partake of whatever comestibles we could find therein. Since our last visit the receptionist had been replaced with a ticket-reader, no doubt an efficiency gain but hardly a winner in the charm stakes. Fortunately there were muffins. The journey to London was rapid and uneventful, which I suppose has to be recorded as a plus point. Euston was wet, and after meeting up with Malcolm and Frank we sought out the dryness that was the Doric Arch. During a liquid lunch various options were discussed for the afternoon. Jim favoured further exploration of London’s suburbs by train, whilst the rest of us opted to seek out the high culture that only the city centre could provide. The Tate Modern no less, easily reached by Tube to London Bridge and a stroll along the south bank of the Thames. In reality the stroll turned out to be more a saga of exploration, as someone had inconveniently constructed lots of buildings between our Underground exit and our destination, requiring numerous deviations and not a few confident ‘I’m sure it’s just along here’ assertions to encourage the stragglers. Various other cultural attractions (the Golden Hind and the Globe Theatre to name but two) received no more than cursory glances as we navigated our way resolutely westward. Eventually we arrived, and prepared ourselves for the best that London’s thespians could provide. To be fair, it has some 'proper' art, including Matisse, Picasso and Henry Moore. However most of the exhibits are, shall we say, more challenging to interpret, reinforcing the author's belief that the talent lies more in the presentation than in the execution. And that is not necessarily to belittle it, it just needs a different set of cranial software to appreciate it properly. Perhaps it was just the engineer in me that made me think the best exhibit was the overhead travelling crane, left to gather dust as a reminder of the building’s previous use. The most interesting was undoubtedly the group of workers (or possibly performance artistes) carefully assembling a life-sized plastic tree. All too soon our cup of culture was full to overflowing, and it was time to move on. We tore ourselves away from the various experimental installations, minimalist thought pieces, conceptual demonstrations and even the odd painting, and headed off towards Paddington. The route took us over the Millennium Bridge, still the most scenic route over the Thames, at least until the Garden Bridge gets planted. At the station we met up with Jim, returned from extensive wanderings over the eastern part of London's rail network, and had dinner at a convenient restaurant. Whilst waiting for the Night Riviera to be prepared to our exacting standards, we assessed the quality of the Great Western Railway's First Class Lounge. More than adequate we thought. The journey passed uneventfully, and we awoke in good time for the minimalist (modernist?) offering which now passes for breakfast on sleeper services. We also remembered we were getting off at Hayle rather than going all the way to Penzance. At Hayle we found right next to the platform our home for the next three nights, a genuine GWR holiday coach. We had arranged with our hosts that we could leave our bags in the signal box play cabin, taking due care to avoid waking the current coach occupants.This manoeuvre completed successfully, we headed off across town for second breakfast at an only-just-open Asda. Then the real work began. The itinerary called for a steady succession of excursions up and down Cornwall's main line and assorted branch lines, with only limited time off for good behaviour. First off was a trip on the Bodmin and Wenford Railway. An Up train took us east to Bodmin, where we had a considerable wait in store for the preserved line's train to Bodmin General. Fortunately Tony did what we bring him along for (apart from organising all the tickets) which was to reconnoitre unknown territory and Find Another Way. 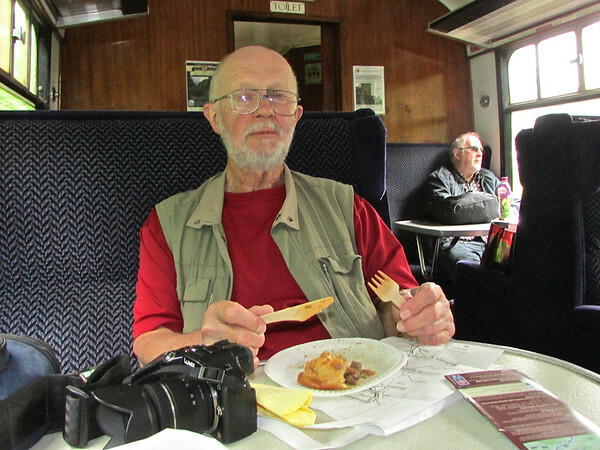 This time he found a bus, which took us to Bodmin General not only in time to take a return trip behind a proper pannier tank, but also to indulge in a cream tea. The afternoon was another indulgence, a visit to Nick and Grace Wood in Wadebridge, to play trains on their Bodmin and Wadebridge narrow-gauge garden railway. And it was a proper joint effort, the viaduct built by Grace would undoubtedly have found favour with the great I K Brunel himself. The railway not only looks prototypical but also runs likewise, with proper interlocking of points and signals, and tokens to control access to the various sections. In modelling terms it was clear that Merseyside's loss was Cornwall's gain. The time passed quickly, and we had to depart in our plus-size taxi back to Bodmin for the train to Hayle and our sleeper coach. The latter's proximity to the main line had the benefit not only of easy access, but also of a steady supply of assorted train services to identify and receive comment on their timekeeping. Next day we set off in the opposite direction, one stop down the line to St Erth, where we changed to a branch line train for St Ives. En route we picked up increasing numbers of day-trippers intent on doing the same day trip as us, whilst taking advantage of the Park-and-Ride service. 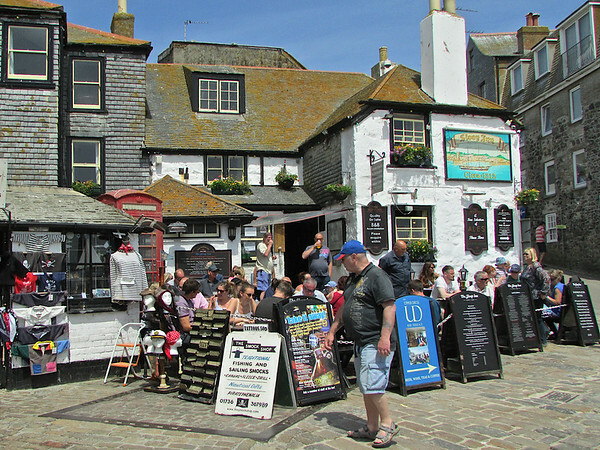 St Ives turned out to be a smarter-than-average holiday resort, with more art galleries per square yard than most provincial cities. Fortunately it was also well provided with the essential Wetherspoons facilities, so we were able to continue the practice of multiple breakfasts, not to mention sequential dinners. 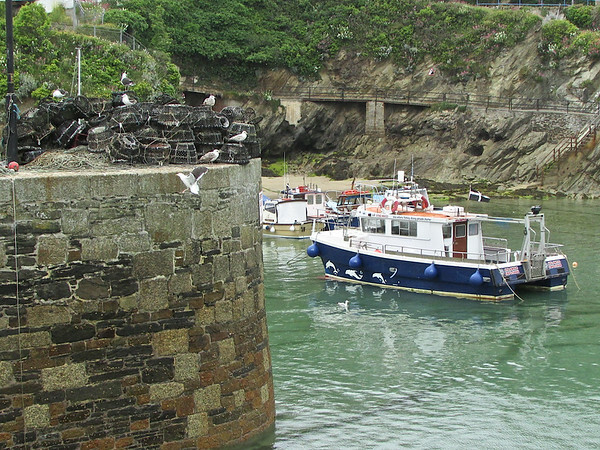 Strolling around the picturesque harbour was a relaxing affair, even with the crowds, whilst Jim found peace and harmony in the harbour, courtesy of a boat trip. 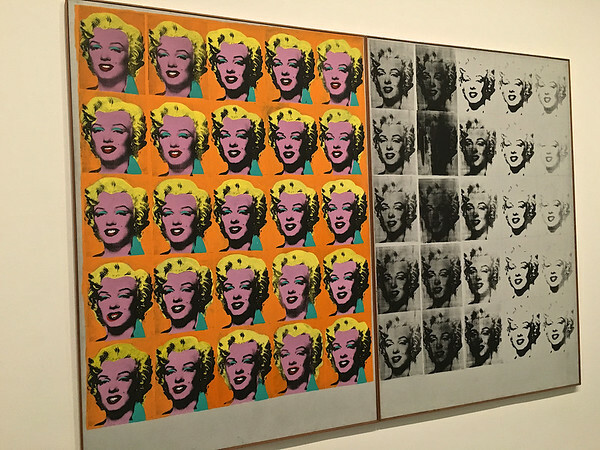 As all avant-garde aficionados know, there is another Tate in St Ives, and we were looking forward to comparing and contrasting the two galleries. However the western outpost was closed for a major refurbishment, apart from the gift shop of course. One wonders if they had not missed a trick in surrounding the site with fencing and chipboard - could not the upgrade itself have been marketed as the ultimate Installation Artwork? There would doubtless be many punters - sorry, connoisseurs of Extremely High Art - happy to pay a premium price to observe cranes, concrete mixers and sweating bricklayers acting out a purposeful ballet symbolising the rise of Modernism in a contemporary Cornish landscape. A memo to Melvyn Bragg follows directly. Just for variety we returned to Hayle by bus, for evening drinks on the terrace and more train-watching. The next day had been provisionally scheduled for a visit to Falmouth, but for reasons which have already faded we opted for Newquay. This involved a ride up the main line to Par, with time for liquid elevenses in an adjacent pub. The branch line train then took us across country to Newquay. There we paid only minimal homage to the town's somewhat in-your-face tourist delights, preferring instead a walk down the route of the old harbour tramway to the harbour itself, and a pasty-based lunch. We returned via Par to the main line but, in the madness that can strike holidaymakers of all types, sizes and ages, we spurned alighting at Hayle in favour of continuing to Penzance. There we hoped to find an elegant historical town proudly displaying its architectural and cultural heritage. Instead we found a somewhat depressing and down-at-heel port that seemed to have given up trying to be successful. Perhaps that is too pessimistic, but it is difficult to see a good reason to return, apart perhaps to take the Scillonian to the Isle of Scilly. We retreated to Hayle, and awarded ourselves fish and chips from an award-winning takeaway, consumed on the previously-described terrace. Day 5 was the parting of the ways, with Frank due to leave us to gather strength, stamina and other resources in preparation for a family wedding, in Italy no less. We left Hayle on the train yet again, this time going up-country to Totnes. From there it was but a short walk to Totnes Littlehempston, which one might be forgiven for thinking was the abode of one of Bertie Wooster's more affluent acquaintances, rather than the eastern terminus of the South Devon Railway. The SDR is a seven-mile preserved line that is proud of both its GWR heritage and the scenic landscape through which it passes. 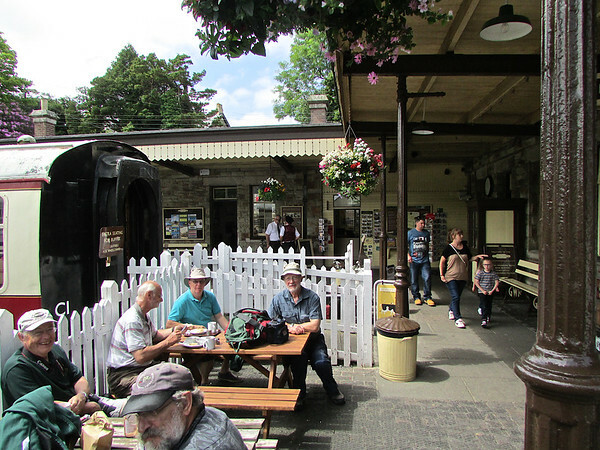 We certainly found no fault with either, and at the end of the line at Buckfastleigh we not only enjoyed lunch in the station cafe but also undertook a careful inspection of its museum exhibits, both indoor and outdoor. Whilst exploring the far reaches of the site we encountered our second garden line, the Dartbridge Railway. This is an extensive raised line with both 32 and 45mm tracks, which at our visit were busy with a variety of live steam and battery-electric trains. Needless to say we felt obliged to give the installation our undivided attention for some time. After another scenic ride back to Totnes we secured our B&B and gave Richard and Jim time off to explore a local micro-brewery with attached retail outlet. They used their bonus leave to good effect, we understand. In case everything had been too simple and straightforward so far, the following day's outings were an exercise in organisational complexity. The Dartmouth Steam Railway and River Boat Company has, as its name suggests, a number of attractions on offer, and we were determined to sample as many as we could in one day. Their promotional leaflets are comprehensive to the point of inducing bewilderment at the variety of options and the mental agility required to string them together into one do-able package. The Company has a brave stab at doing this for you, but one gets the impression it is all a bit much even for them. Indeed I have to report that on attending their Totnes booking office early in the morning the officer in charge expressed some doubt as to knowing what exactly was on offer that day. If not him, they how could we, was the obvious question. Fortunately a phone call to Head Office established that our preferred list of activities was available, and in the correct sequence, which was even better. For the record, we took a cruise from Totnes to Dartmouth, a coal-fired paddle steamer river trip (or in Jim's case two trips), a ferry to Kingswear, a steam train ride to Paignton and a bus back to Totnes. A bonus feature was a display by the Red Arrows at the Torbay Air Show, with the train providing a fine viewing point. After that extravaganza of transport, something a little simpler was required for the following day. Just a train to Taunton and a bus to the West Somerset railway at Bishop's Lydeard. However we reckoned without that colossus of compulsory fun and frivolity that was Butlin's at Minehead. According to a Man Who Knew at Taunton station (wearing a uniform so he must be in the know) there was no chance of a bus westwards, as all available seats would be commandeered to deport hapless pleasure-seekers to the fate awaiting them at the seaside. So it was a jumbo taxi again, which delivered us in timely fashion ready to explore the longest preserved railway line in the UK. Apparently rover tickets were the order of the day, which according to the timetable would allow us to travel the full length of the line three times whilst enroute to Minehead. Predictably, Jim opted for this without hesitation, whilst the rest of us decided to curtail our journey at Watchett on the second leg. This had the important consequence of creating a cream tea-sized hole in the day's programme, which we considered duty-bound to fill. For our final night we dined at the inevitable Wetherspoons. Other pubs are available, we understand. 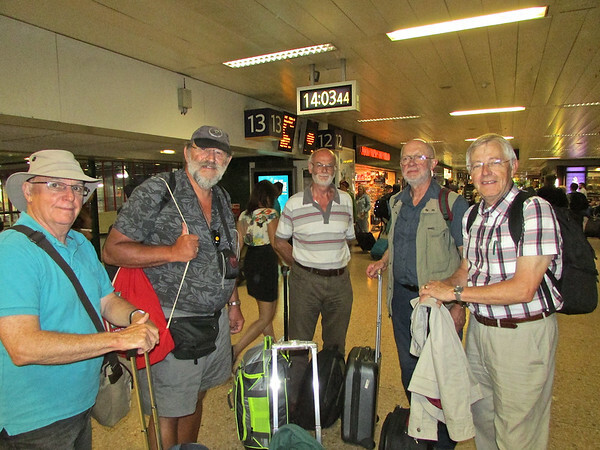 The final day saw another temporary split in the party, as Richard and Derek opted to take the bus to Taunton rather than the train followed by a shorter bus ride. Because we could, that's why. The train to Birmingham was crowded and devoid of meaningful seat reservations, owing to an earlier train failure. New St. was also crowded, not because of any failures that we knew of, although some might say that the new, improved concourse made things a touch more error-prone for passengers. A new set of barriers had been erected to control flows around the periphery, so woe betide anyone mislaying their ticket whilst changing trains. All part of a brave new world of customer service. Fortunately no such problems befell us, and we navigated our way confidently onto the right train on the right platform, and headed back to Liverpool Parkway and the delights of Merseyrail. Except for Malcolm, of course, who retreated back to the Soft South for rest and recuperation before the next adventure.